WASHINGTON (Feb. 15, 2013) -- The lack of an appropriations bill coupled with sequestration could eventually translate to Soldiers being delayed in their redeployment home from Afghanistan, the Army's chief of staff said. Gen. Ray Odierno, speaking at the Brookings Institution Friday in Washington, D.C., explained that replacement forces to Afghanistan in 2014 could be affected by a shortage of training dollars and be forced to delay their deployment. 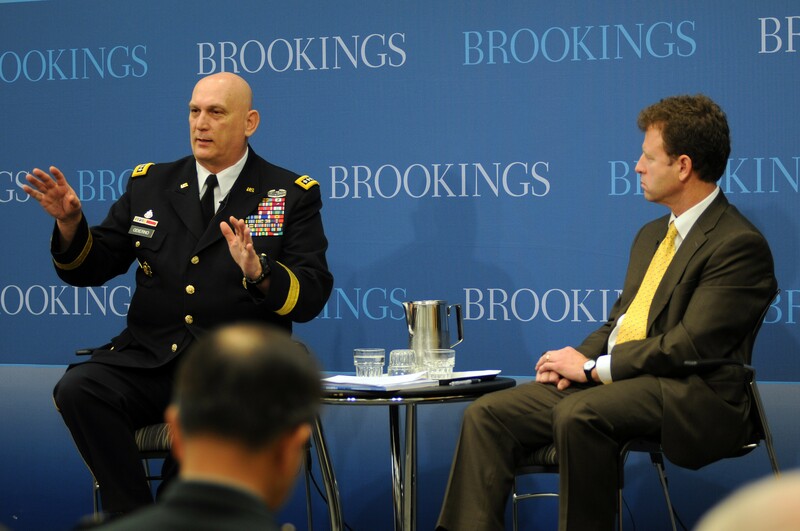 Chief of Staff of the Army Gen. Ray Odierno answered questions from the audience and from Michael O'Hanlon, a senior fellow at the Brookings Institution, Feb. 15, 2013, during a visit at the Brookings Institution in Washington, D.C. The Department of Defense has already agreed to nearly $800 billion in cuts, the general said. Sequestration will mean an additional $500 billion in defense cuts, and shifting funding for improvised explosive device, or IED, detection and electronic warfare equipment from overseas contingency operations budgets to service operations and maintenance budgets will mean an additional $100 billion in cuts. The U.S. military is looking now at a possible $1.3 trillion in defense cuts overall, Odierno said. Compounding cuts to defense budgets is the lack of a confirmed budget for the services -- the military is operating now on a "continuing resolution," which is how Congress funds the government if it has not passed an appropriations bill. A continuing resolution makes military planning difficult. "Today, in my opinion, the greatest threat to our national security is the fiscal uncertainty resulting from the lack of predictability in the budget cycles," Odierno said. "Our country's inability to put its fiscal house in order compromises the future of the joint force, the Army, and ultimately will impact our ability to provide security to our nation." Right now, Odierno said, the continuing resolution has created a "mismatch of funds" that doesn't leave enough in the operations and maintenance accounts, known as O&M funds. There's a $6 billion shortfall there compared to what the Army needs, and sequestration will add another $5.4 billion to that shortfall. It's O&M funds that allow the Army to train, so a shortfall in O&M funds means that fewer Soldiers will be able to train for Iraq and Afghanistan. "We're funding, totally, Afghanistan. We're going to fund, totally, Korea, and sustain the readiness level in Korea," Odierno said. "What that means is the rest of the forces that are now back in the United States will not be able to train. They will be able to do very small-level, squad-level training. They will not be able to do platoon-level, company-level, battalion-level training back at their installations. They will not be able to go out to combat training centers, which is what provides them the final readiness certification at the battalion and brigade level." The general said the forces that are slated next to go to Afghanistan are going to be ready to go, insofar as training and equipping is concerned. "What my concern is, the ones who come after them, they will now be behind," he said. What that means for the forces in Afghanistan in 2014 is that they might have to wait to redeploy while the follow-on forces are readied for their deployment. Earlier this week he told Congress as much, saying he offered two options to lawmakers on how to keep forces in Afghanistan. "If I can't make them up quickly, I then have to send forces that aren't ready, or I have to extend forces that are already there," he said. "That'll be a decision I have to make as we get closer. We will continue to try to divert money so we do not have to extend people in Afghanistan." The Army's share of defense cuts could mean the loss of civilian employees at Army depots where war-ravaged combat equipment is "reset" and made serviceable again for Soldier training and deployment to combat zones. Odierno said looming budget cuts will mean smaller depots and a drop in the civilian work force. That translates directly into a backlog of equipment to be reset, including the equipment that still needs to be reset from Iraq, and equipment coming out of Afghanistan right now. The general said that due to those backlogs, it's expected that delivery of that reset equipment could be delayed by two to three years, with some being delivered as late as 2016. Unfortunately, not having that critical combat equipment available, tanks and helicopter and infantry fighting vehicles, for instance, means that Soldiers who need to train on it won't be able to train. Additionally, that equipment won't be ready for deployment if the Army is called upon to fight again, and predicting when that will happen is not something the military does well. "We have not predicted very well when we will use forces," Odierno said. "When the [Berlin] Wall came down in Europe, people said 'this is it, we don't need [the Army] anymore.' But then a year later, we are deploying to the deserts of Kuwait. Then we went into Somalia. Then somewhere in there we had Panama, and 'Just Cause.' You just don't know. It is our responsibility to prepared, that if the president decides he needs to use the military, that we are ready and prepared. And I am concerned whether we will be able to do that or not as we move to the future over the next couple of years." Right now, Odierno said, the Army has a "fairly high level of readiness." But that will change soon, for both Soldier readiness and equipment readiness. When the time comes, unexpectedly, for Soldiers to deploy, emergency funding will not be enough to provide for Soldiers the readiness they need to fight successfully, Odierno said. "It slowly degrades," he said of military readiness. "So over the next six or seven months, if you are not taking care of your equipment, if you are not training, you degrade that readiness. And you can't just recover that readiness by money, it takes time." Paying for people, Soldiers, takes up about 48 percent of the Army's budget. Cuts to the budget means a reduction in the number of Soldiers the Army will have in the ranks. The Army is already reducing the number of Soldiers in its ranks by about 88,000. Sequestration could bring the loss of an additional 100,000 Soldiers across the active force and the reserve components, Odierno said. In all, about 190,000 Soldiers will have to be cut, though the general believes it will be more than that. "My guess in the end, it'll be over 200,000 Soldiers we will have to take out of the active duty, Army National Guard, and U.S. Army Reserve," he said. That cut will mean a loss of force structure, he said. It will cost the Army a 40 percent reduction in brigade combat teams, when it's all done. A smaller Army means a loss of ability to influence and deter conflict, the general said. If the Army gets too small, "you lose your ability to deter conflict. My concern is, you have people who miscalculate. Almost every great war we've been in to, or great regional conflict, has been based on a huge miscalculation by somebody. And what I worry about is we will cause people to miscalculate, which will then cause us to have to get involved." Odierno said that without sequestration, the Army may drop below 490,000 Soldiers, something he said is doable, if managed correctly to avoid loss of skill and capability. If sequestration does happen, he said, he is concerned about not dropping below a specific number, one he didn't say, to avoid losing the ability to deter conflict, and to ensure the Army has the capability to do the things the president asks the Army to do. That number, he said, might be smaller than 490,000, "but some of the numbers I hear are too small. I do worry that the capability will be much less than we need. "I think there is a certain level of capability that I need to have, that I would propose to the president and the chairmen and others that we have to have in order to sustain our capabilities in order to respond globally," he said. Cutting the force that deep, he said, will have to be done carefully, and across all components of the Army. A proper balance must be made, he said, to preserve the unique capabilities each component brings to the fight. In particular, he said, the active component maintains a higher level of readiness, while the reserve component brings a more diverse mix of experience and capability to the table. Odierno said he doesn't want to force Soldiers out of the service, but at some point, some of that might happen. For the first set of cuts, he said, done over a five-year period, it'll be mostly attrition. "There will have to be some other methods," he said. "But it will be mostly, about 75-80 percent by attrition." With additional cuts, he said, "we'll probably have to increase the amount we put out each year, but I would still like to leave it at a level where I can control it," Odierno said. "If we can control it, we keep the people we want to keep, we are able to help the people transitioning to better transition, and that enables us to keep the level of readiness we need to respond." Odierno said his goal is to do the "large majority" of force cuts by attrition. But personnel boards that make other cuts might have to come in to the mix at some point. "There will have to be some boards that we conduct that we maybe ask people to retire earlier than they might want," he said. "And there might be some boards that tell us we need some officers and some senior noncommissioned officers to leave. But we will try to minimize that as much as we can."